« Remember When Phones Hung on Kitchen Walls? Being a preceptor for area internship programs is my way of giving back to the dietetics profession. Texas Woman’s University intern Lauren Nygard wrote a guest post during her rotation. Like Lauren, I love beans/legumes and have written several posts about them here and here. I’ve been on a bean kick lately! Black, garbanzo, white, green—you name it, I’ll eat it. At the beginning of high school, I wanted a change and decided to become a vegetarian. I spent my fair share of time searching for the “best” plant-based protein. Although I ended my vegetarian career after 5 years, I still find myself choosing meatless over meat-filled meals. They are budget friendly. Whether you buy them canned or dried in a bag, beans only cost a few bucks and last months in the pantry. I tend to buy canned beans for convenience purposes. Tip: Research shows draining and rinsing canned beans reduces sodium content by 41 percent. They’re a great source of plant-based protein. One cup of cooked beans provides about 15-17 grams of protein. Add a grain and a fat source and tada—a well-balanced meal! They are a high fiber food. On average, beans have 14 grams of fiber per one cup serving. They provide the two types of fiber: soluble and insoluble. Soluble fiber reduces cholesterol, while insoluble fiber keeps digestion regular and prevents constipation. Plus, both types increase satiety, helping you feel fuller longer. They contain essential vitamins and minerals. Beans are rich in many micronutrients, which many Americans lack. For example, they’re good sources of folate, potassium, magnesium, iron, phosphorus, manganese, thiamin, and other B vitamins. They have health benefits. As I mentioned earlier, the soluble fiber reduces cholesterol decreasing risk for heart disease. Beans have also been shown to aid in blood sugar control of people with type 2 diabetes. A study conducted in 2012 found that increased consumption of legumes lowered HbA1C values, blood pressure, heart rate, and risk of coronary heart disease. While these beans are amazing on their own, the best part about them is their versatility. While these beans are amazing on their own, I’d have to say the best part about them is their versatility. Here are a few options—use my Simple Black Bean Recipe below. Add them to burritos, tacos, quesadillas, or enchiladas for a filling protein source. Make a soup by adding more vegetable broth. Blend in a food processor to create a smooth and creamy bean dip. Serve with tortilla or corn chips. Mash with a fork and use as a spread for tostadas or sandwiches. Create a burrito bowl! Use rice and beans as the base, then top with avocado, pico de gallo, sour cream, and cheese. Heat olive oil over medium-low heat. Add the garlic and cook for 1-2 minutes. Add in the remaining ingredients and heat for about 5-10 minutes, or until most of the vegetable broth is absorbed. Taste, then season with salt and pepper as necessary. Other great toppings: Cilantro, chipotle pepper, cheese, or sour cream. *If you want to add the onion, I recommend cooking it with the garlic. Jenkins DJA, et al. Effect of legumes as part of a low glycemic index diet on glycemic control and cardiovascular risk factors in type 2 diabetes mellitus: A randomized controlled trial. Arch Intern Med 2012;172(21):1653-1660. Duyff DL, Mount JR, Jones JB. Sodium reduction in canned beans after draining, rinsing. JFST 2011;9:106-112. 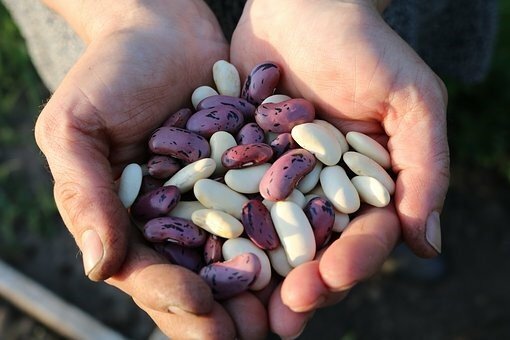 I eat lot of beans and I am glad to learn that they contain a lot of essential vitamins and minerals. Since beans have to be boiled to make them soft enough to cook or prepare different types of dishes, does the boiling process take away much of the nutritional value? Does re-frying beans also take away any of the nutritional value?